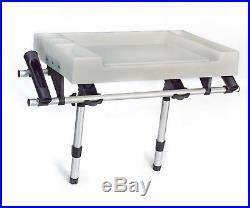 Pactrade Marine Boat Fishing Deluxe X-Large Bait Fillet Cutting Board Rod Holder. This is 100% brand new high quality cutting board made of long lasting UV stabilized polyethylene material It comes with 2 anodized aluminum adjustable legs which suit to standard type of rod holder. It provides a rigid and stable surface. 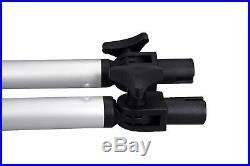 Plastic adjustable knuckles and stoppers which allow board to be used in angled or straight rod holder. 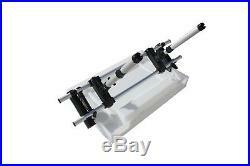 2 side rod holders is designed to be mounted to the bait board frame. Bottom compartment is designed to catch run off fish guts, blood etc. This extra-large cutting board is essential for anyone going to fishing in a boat. Easy to install, you can simply slip this cutting board into two spare rod holders. 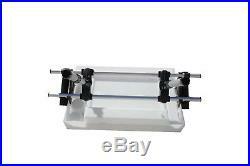 This item includes 5 compartments in total. It can be function for storage of knife, lures, tackle, drinks, etc. It can be easily removed for storage and cleaning after usage. Material: UV Polyethylene & 2 anodized Aluminum tube. Manufactured from long lasting UV stabilized food-grade polyethylene material. Dual Mounts for greater stability. 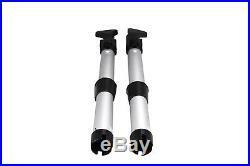 2 anodized aluminum adjustable legs, suits standard rod holders. Easy to install, simply fits into your boat’s existing rod holder. Can be easily removed for storage and cleaning. Overall Dimension: L: 32.25&###x2019;&###x2019; x W: 15.50&###x2019;&###x2019; x H: 23.75&###x2019;&##x2019. Cutting Board Dimension: L: 26.5&###x2019;&###x2019; x W: 17.25&###x2019;&###x2019; x H: 3.5&###x2019;&##x2019. Customers please note every computer shows colors differently. All measurements are approximate. 48 continental states only. International Buyers – Please Note. We offer discounted international rates for our customers. We ask that customers seek out these details before purchasing. Ask for your discounted combined invoice before making any payments. We do not give discounts if you pay separately or already paid before we sent you a combined invoice. When items are too large to be packed together-packing them together may cause damages to the products. When items are fragile-packing them with other products may cause unwanted damages. When items are very heavy-This may also cause damages. We will notify you if this phenomenon occurs. Again, these are rare cases. The safety of your products is of prime importance to us. Any item with no original box. Any item that has been used unless damaged or defective. We will only give credit for merchandise received based on original claim made. Please inspect all merchandise carefully for any damages or defects upon receipt of item. Any damages or defective products should be reported within 7&###xA0;days upon receipt of order. Failure to do so within the time specified may result in forfeiture of credit for damaged/defective items. See our other items. –Color: White —Material: UV Polyethylene & 2 anodized Aluminum tube —Manufactured from long lasting UV stabilized food-grade polyethylene material —Adjustable rod mounts. Dual Mounts for greater stability —2 anodized aluminum adjustable legs, suits standard rod holders —This item includes 5 compartments in total. 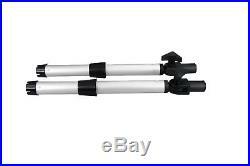 –Easy to install, simply fits into your boat’s existing rod holder. Can be easily removed for storage and cleaning —Overall Dimension: L: 32.25’’ x W: 15.50’’ x H: 23.75’’ —Cutting Board Dimension: L: 26.5’’ x W: 17.25’’ x H: 3.5’’ —Item Number: PM260003 Customers please note every computer shows colors differently. The item “Pactrade Marine Boat Fishing Deluxe X-Large Bait Fillet Cutting Board Rod Holder” is in sale since Monday, January 22, 2018. This item is in the category “Sporting Goods\Fishing\Fishing Equipment\Fish Processing & Cooking\Fillet Tables & Cutting Boards”. The seller is “pactrademarine” and is located in Edmond, Oklahoma. This item can be shipped to United States.